Rabbit anti Bovine, Canine, Equine, Human, Mouse, Porcine, Rabbit, Rat Lumican. The immunogen for anti-LUM antibody: synthetic peptide directed towards the middle region of human LUM. Synthetic peptide located within the following region: AFKGLKSLEYLDLSFNQIARLPSGLPVSLLTLYLDNNKISNIPDEYFKRF. 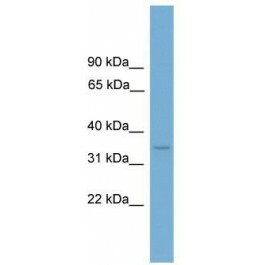 This gene encodes a member of the small leucine-rich proteoglycan (SLRP) family that includes decorin, biglycan, fibromodulin, keratocan, epiphycan, and osteoglycin. In these bifunctiol molecules, the protein moiety binds collagen fibrils and the highly charged hydrophilic glycosaminoglycans regulate interfibrillar spacings. Lumican is the major keratan sulfate proteoglycan of the cornea but is also distributed in interstitial collagenous matrices throughout the body. Lumican may regulate collagen fibril organization and circumferential growth, corneal transparency, and epithelial cell migration and tissue repair.